NUSTEP Content Management Server provides functionality to manage web content. It enables non-technical business users to effectively create and manage content of web sites and portals effectively. NUSTEP Content Management Server automates the processes of content creation, management and publishing. It enables organizations to increase the value of published information and thus make communication with customers, partners and employees more efficient. The cost of creating and managing web content increases rapidly with the growth of size, complexity and audience reach of the website. NUSTEP Content Management Server automates standard tasks of content management and enables to decrease the overall costs. NUSTEP Content Management Server enables non-technical business users create and manage web content. It eliminates the need to convert original content for web publishing and move the responsibility for content publishing straight to the employees of the company. Customers demand actual, accurate and relevant content. NUSTEP Content Management Server enables to increase the value of published information. Functions such as publishing workflow, version control and site usage analysis ensure that published content is always current, accurate and corresponds with current customer’s needs. Web sites provide faster access to information than traditional communication media. 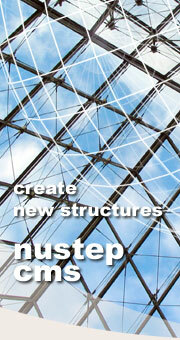 NUSTEP Content Management Server provides infrastructure for creation of standard navigation structure and templates. This consistency increases usability of the website and in cooperation with usage of metadata results in faster information retrieval time. NUSTEP Content Management Server enables to create consistent and usable content structure. Centralized design and branding control ensures the message and site design are consistent with a company’s brand and values. NUSTEP Content Management Server enables organizations to improve the information traditionally blocked in static web pages and other documents across the organization. By enabling business users to take a direct role in a website content creation, it opens new communication channels between a company’s business users and customers to deliver relevant competitive advantage. NUSTEP Content Management Server supports open communication standards. It enables to reuse existing content in new and in existing web applications. Organizations can adopt innovative communication tools such as internationalization, customer relationship management, personalization, application integration, enterprise portals and others.